It seems like 4 and half years passed just like a few weeks. You know hanging around with friends, gossiping on movies, women, architecture (sometimes) and lot more, and time has passed down the bridge like a river promising to never come back again. Lecture classes, night outs, design trips and sleeping on a college lawn during the day, I am more than little surprised with myself being at the verge of completing the five long years in a few months. Yes, I am now on my last ride, and wish me good luck so that your prayers would bless me a safe and of course interesting end to my college life. We started off quite bizarrely; on the way to Kolkata (Don’t know why Scholarship Division sent us to Kolkata while we could have directly gone to Delhi) our bus met with an accident on the fateful night. Handy boy had jumped outside and driver was still lying on his seat unhurt when I woke up to the commotion around. Looking through the window, in the flood of lights, I saw a man running towards the bus with a slipper in hand. Behind him, a big huge truck was crashed into a big chunk of waste. And driver was lucky to have escaped. Police at midnight gathered in an unknown place. We were asked to take out our luggage as the bus will not be allowed to continue its journey. And I was less than enjoying the adventure. My first venture towards an unknown place and I end up getting deep into the unknown trouble which threatens the end of my journey even before I really start it. After hassling and arguing with the handy boy, we waited for a bus to ply by and it already passed dinner time. Anywhere in India, something or the other always keeps on running on the road unlike our country where we hardly have any vehicles moving during the night. We boarded on another bus which was almost empty and in few minutes, it reached us near the dabaa. In an agony of sudden shock and being hungry, we rushed to a big restaurant. It was so funny, the owner never let anyone to leave his dabaa until one paid Rs.100 whether one has eaten more or less, no one knows including the owner. In a broad day light, next day our bus was playing right through the busy street of Kolkata. Over a night, the bus dropped us right in the heart of Kolkata city. We were received (as in waited for) by a complete stranger who claimed to be a person responsible for getting our train tickets. He took us to a nice restaurant and later to a Howrah train Station. It was time to depart with other friends. Train experience was the first time in life and it was also first time in life that I got myself walking in a place crowded with thousands and thousands carrying luggage, shouting, begging, and walking. It was the busiest affair in Howrah. Train was of course comfortable and cool for almost Rs. 2600 which could have been much lesser lest we have taken direct from NJP. 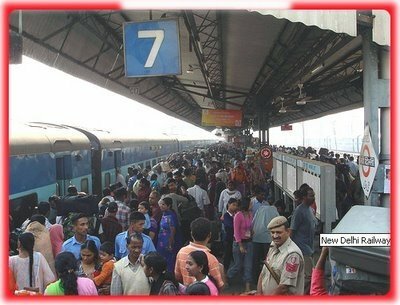 And New Delhi station was even busier than the one in Kolkata. The trains honking, women shouting in a speaker, people running here and there, we got lost not knowing where to go now. Unlike the one in Kolkata, in Delhi there was no one who could take us to our college. In a wake of all the commotion and confusion, a decently dressed up man approached three of us asking where wants to go. We were expecting a person from a college who could take us to the college and help us in getting accommodated comfortably as we were briefed by Scholarship Division a few days before we were supposed to leave. And it turned out to be so untrue. Take my advice my friends; in India if you know little bit of anything Indian, take it and claim it, it helps one in getting favors from a situation. We took ourselves at the mercy of situation and of course a pure sanctity of human reaction towards any helpless person and a new in other’s place that they would help us to get through out of it, but it was a mistake. Speaking in English even though I knew little bit of Hindi, it back fired completely. It made him easy to pounce upon us , every damn foreigner for him is a profit. For a reasonable price (as he claimed), we took a cab to our college which later on turned out so near for an amount of Rs. 300. However, for another extra Rs.200, we have to take our cab to the hostel as college campus is divided into a college classroom and hostel which are separated by about 10 kilometers. Luckily when we reached the hostel campus that too after lurking into so many corners, hostel warden called some Bhutanese students there. First experience in India and already bouncing with much to share, I let the cheatings and accidents go for our college life was about to take its mark.